UNIGINE has support for Microprofile, an advanced external embeddable CPU/GPU profiler with support for per-frame inspection. 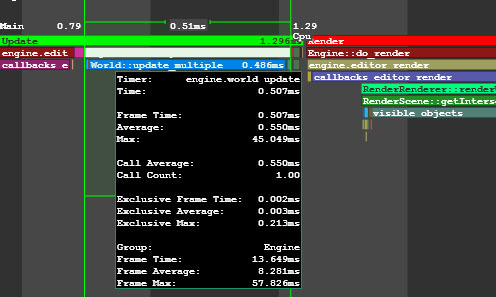 Profiling operations performed by the engine on CPU and GPU. Profiling up to 1000 frames. The performance data output to a local web server or to an HTML/CSV file. The Microprofile is available only for the development builds of UNIGINE Engine: it won't be compiled for the debug and release ones. You can use the microprofile_info console command to check if the Microprofile is compiled. The performance data obtained by the Microprofile can be output to a local web server or to an HTML/CSV file. 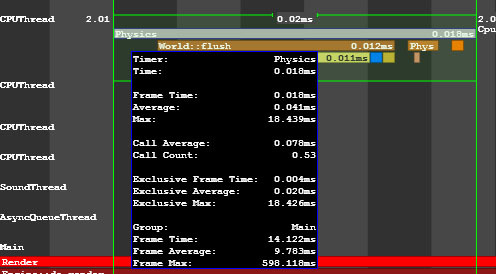 The Microprofiler shows valid information only after the first 1000 frames are rendered (e.g. at the framerate of 60 FPS, such “warmup” time comprises about 16 seconds). In the console, set the the number of frames to be profiled via the microprofile_webserver_frames console command. You can skip this step: by default, 500 frames will be profiled. If required, disable GPU profiling. On the Menu Bar of UnigineEditor, choose Tools -> Microprofile. The performance data will be displayed in your Web browser. You can display only a part of the profiled frames: in the Web browser address bar, add /<number_of_frames> to the current URL. For example, if you specify localhost:1337/100, only the first 100 frames will be displayed. In the console, set the the number of frames to be profiled via the microprofile_dump_frames console command. You can skip this step: by default, 1000 frames will be profiled. Run the microprofile_dump_csv or microprofile_dump_html console command. The performance data will be saved to the specified .csv or .html file. 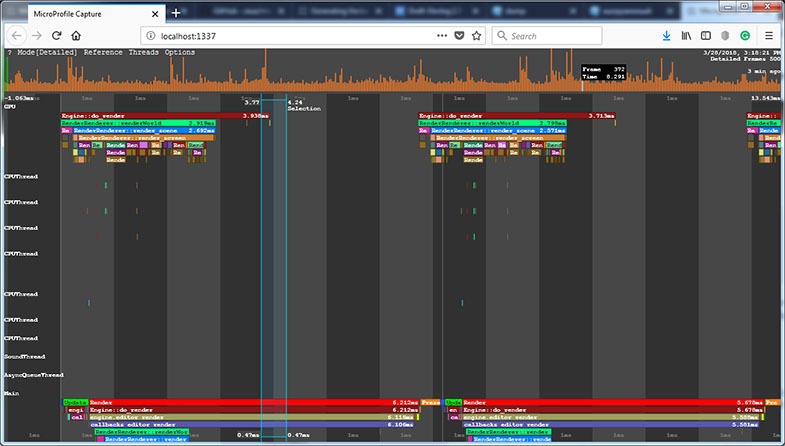 Using profiling dumps simplifies capturing performance "spikes": the engine continues rendering the application in the background even when it is out of focus, so the frame where the spike has occurred can be overwritten in case of using the Web server for performance data visualization. Also it can be used to estimate the optimization results: you can dump frames before and after optimization and compare them. 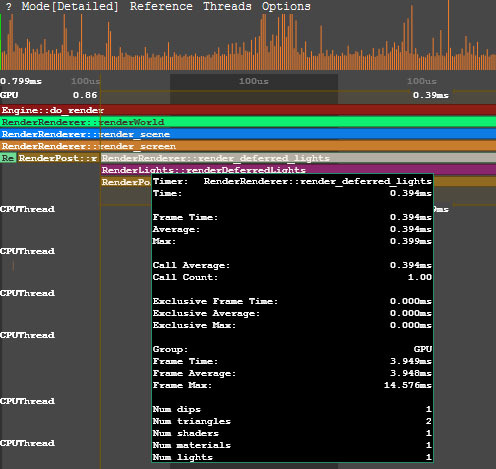 All available console commands can be found in the Performance Profiling section of the article on Console. 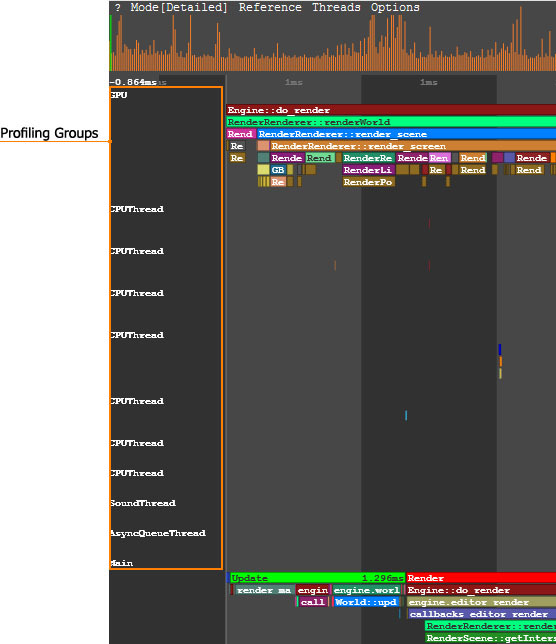 The Microprofile visualizes the detailed per frame performance data on the operations performed by the engine on CPU and GPU (if enabled) and on the engine threads. 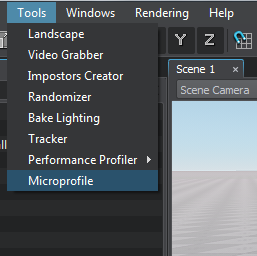 In the Microprofile main menu, you can change the visialization mode: click Mode and choose the required one. By default, the Detailed mode is set. In the Detailed mode, each operation (function) and thread is displayed as a separate colored region. The regions are hierarchical: the function called by the other function is displayed under the last one. The size of the region is determined by the time the corresponding operation takes. To view the data on a certain operation or a thread, point to the corresponding region. To zoom in/out the displayed regions, scroll the mouse wheel. In the Main group of the performance data, the call stack of the operations (e.g., update, rendering, etc.) performed by the engine on CPU is displayed. In the GPU group of the performance data, the call stack of the operations performed by the engine on GPU is displayed. In addition to the main performance data, for each function (e.g. environment rendering, post materials rendering and so on), the number of DIP calls and rendered triangles is shown. Also there can be the number of surfaces, lights, shadows rendered by this function, the number of materials and shaders used; the information on the node or material for which the function is called (identifier, name, etc.). When the region that corresponds to the certain function is pointed, the Microprofile displays when this function is called on CPU and how much time is spent on its performing. The performance data on the engine threads is visualized in the CPUThread, SoundThread, AsyncQueueThread, WorldSpawnMeshClutterThread, WorldSpawnGrassThread groups.